How to protect the 925 Sterling Silver? 1. Put it in an air-tight bag if you not expect to wear for a long time. 2. Usually silver-dip will do a little harm to your jewelry, you could use the silver polishing cloth to wipe the smooth surface of silver jewelry. 3. The sterling silver jewelry should be stored separately to prevent the pieces from rubbing against each other, and cause tiny scratches. 4. Silver Polishing cloths are an excellent choice for cleaning your sterling silver jewelry. They will remove the tarnish and dullness, keeping your sterling gift like new. -Generally speaking, it will take 10-20 days by USPS delivery.If you choose FBA,then you will receive the parcel within 2 days after you place the order. What is your after-sale service? --If you receive a product with any questions or problems, please feel free to contact us, we will try our best to help! 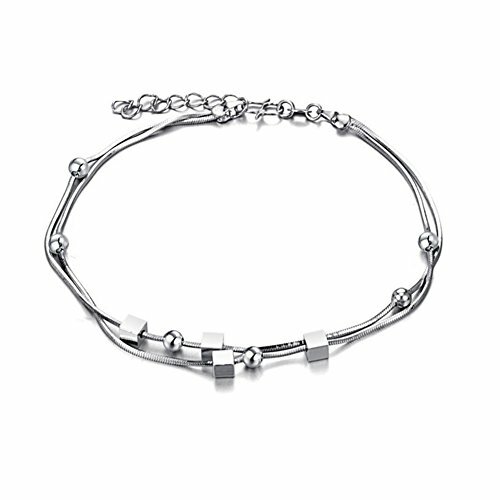 This anklet bracelet is double layered,eye catching! Match with suitable apparel for different occasion.Cost effective! Material: 925 Sterling Silver Chain, with Tiny Beads and Cubes Charms. Size: about 210mm (8.27") in perimeter; Chain Extension: 30mm; .Bead: about 3mm in diameter. Please avoid the Springs, seawater and take off the silver jewelery when you wash or swim. Use the soft cloth to wipe the silver jewelery befor you put it away. Gift Ready- It will definitely make a perfect and inexpensive gift for birthdays, anniversaries, or just as a way to express your love for someone. Whether it's your daughter, sister, mother, best friend, girlfriend, fianc?¡ì?e, or wife, they will absolutely love it! It comes with a fashionable free gift box to make it even more impressive. Now you know how to steal their heart on Valentine's Day! If you have any questions about this product by Mmiiss, contact us by completing and submitting the form below. If you are looking for a specif part number, please include it with your message. Sterling Silver Heart Link Nickel Free Chain Anklet Italy Adjustable, 11"